So I got it. Officially. Paid for and everything. Had to sell two other accordions and Fender Telecaster with amp. Worth every cent. Don’t expect an objective review. Rather, expect a panegyric, an encomium, an elaborate laudation. I have brought the Castagnari Nik home. Paid for it. Begun getting to know it. What a ridiculously effortless ease-of-play it has! Brigid has taken some pictures. Happy. Happy! Don’t want to appear materialistic. Acquiring this thing, being happy. But I am. The sounds that come out of the Castagnari Nik. These sounds will improve my quality of life. Unfortunately, I don’t have the recording savvy to create a document that will truly communicate how wonderfully sonorous the Nik is. I will be going into a recording studio this summer. Here are two videos I shot, recently. The first is a classic French Waltz, Belle Bergére (“Beautiful Shepherdess”). The left hand sounds a little honky on the YouTube. Sounds better in person. The second video is another rendition of The Cheshire Waltz. I wasn’t very happy with the version I shot on the Saltarelle, and then a colleague said, “Bet that would sound great on your Nik.” And it does. Is it the last accordion I’ll ever buy? That’s a beacon of grail shaped dimensions. This two-row, G/C, MM, no-stops box? 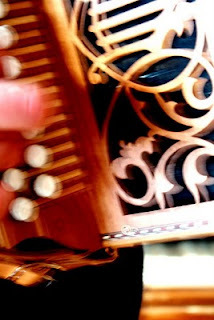 This simple accordion … with it’s sweet sound and exquisite, unbelievable touch? Let’s just say, if it were the last accordion I ever bought, I’d be quite okay. I've often noticed, when playing certain boxes, that the sound is more resonant and rich, and that there is even some “feel” as the resonance is transmitted to my hands while playing the box. Other accordions feel “dead” by comparison, even if they are plenty loud. This positive effect has — in my experience at least — been more typical in full-size, two-voice boxes. I've read some (French) explanations that it is because of the relative amount of open “real estate” on the fondo (“soundboard”), compared to a three- or four-voice box, where the reedblocks take up more space. It could also have to do with the sound bouncing around inside the box. And despite the explanations I've heard from engineers and physicists of various persuasions, enough of these materialistic explanations have been contradictory to instill a good deal of doubt in my mind. Perhaps none of them are wrong, assuming their initial assumptions are correct, but on the other hand, perhaps the initial assumptions are not appropriate to the phenomena that are occurring. I agree, Andy. I'm suspicious of the sort of “mystical” sense of the feel of the instrument. The Nik DOES feel great … sensually so … but as with all sensual things it has a physical basis. Your point about space rings true. I knew a cellist once who told me he picked cello because he felt he could shape the envelope of the sound. I feel that way somewhat with this Nik. I didn't know you were going into a recording studio this summer! Will you be making another CD? Yes. That's exactly my plan. My last CD is eight years old and was recorded on the Hohner. My instruments have improved since then. Hopefully, I have also. That about sums it up – I know the feeling, great description!